“Legs, Legs, Legs,” is the theme of the Maple Leaf Farms annual chef recipe contest challenging professional chefs and culinary students to create a dish which showcases duck legs or duck leg meat as the main ingredient. More than $20,000 in prize money is being offered. The 2017 Discover Duck Recipe Contest is open to professional chefs and culinary students who are enrolled in a professional culinary school. 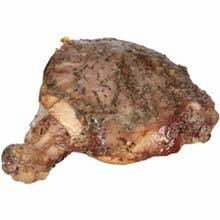 Recipe entries must include a Maple Leaf Farms duck leg product and will be judged according to creativity/originality, accuracy of the recipe and flavor. Professional and student chef recipes will be judged in separate categories, each with their own cash prizes. Entries will be accepted March 1 through June 4, 2017. Professional chefs will vie for a $10,000 grand prize and four additional finalist prizes of $1,000 each. The top student chef will win $5,000 with $500 awards going to four additional finalists. In addition, each student finalist will receive a chef’s knife set. All entries must be postmarked or submitted online no later than June 4, 2017.